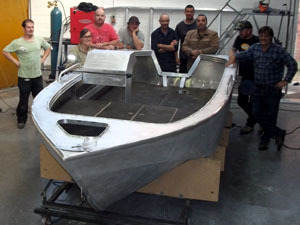 We run Aluminium Welding and Boat Building courses five times per year. The courses are run at our premesis, and are scheduled as weekly intensive courses. 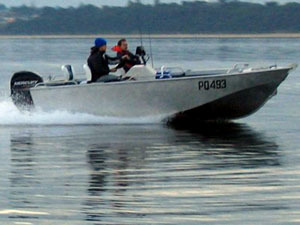 The courses are designed to teach the welding and boatbuilding techniques required to build a boat. 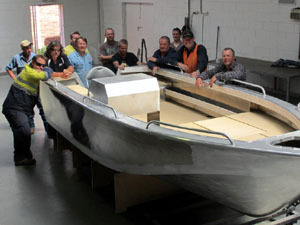 Th courses used to be held at our local Tafe college, but we now run all our courses at our main boatbuilding facility in Cheltenham. In the course, we cover welder types, MIG, pulse MIG, and MIG welders fitted with different types of guns, normal, snake, (long push type guns), and push pull guns. We have many different brands of welders that students can use, these include Cebora, Fronius, T&R, UniMIG and Esseti. We use both single phase welders, (240V), and also 3 phase welders, (415V) in the course. The course also covers the setting up a welder for aluminium, the items you have to change to run aluminium in a convential MIG welder that has previously been setup for steel. 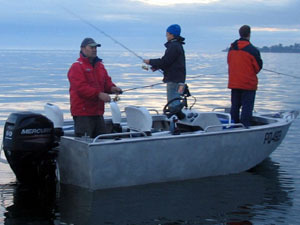 We cover items such as teflon liners, "U" groove rollers, MIG gun types, wire types, brands and other important information required for users who may be attempting to build a boat. At the course you will learn basic MIG welding techniques with aluminium, using different welders. 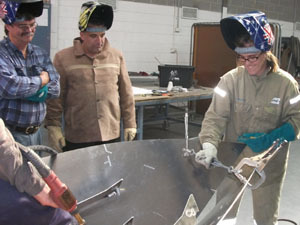 The course covers all aspects of the welding and weld and edge finishing, typical on a Plate Alloy boat. 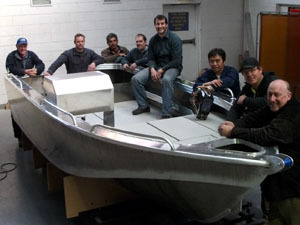 After students get the basics of the welding, we cut a boat kit, and together with the students, we build a boat. We capture the pictorial build sequence and the students are given a copy of the CD in addition to a manual of the build of the vessel and other information regarding welding and boatbuilding. If you would like information on the course, or would like to discuss an on-site course, call John on (03) 9555 6399. The course dates are posted below. Note: There is a maximum of 8 students in each class. These courses are very popular, and if you are interested, please email us and book in to one of the courses listed. Below: Course Boat purchased by Cindie, our first female attendee, She did the fit out, is on the water and is a proud boatowner. Cindie even took us fishing!